Glide along a scenic, wide trail while hearing about some of the many historic sights that Monterey has to offer. This is our most popular tour. 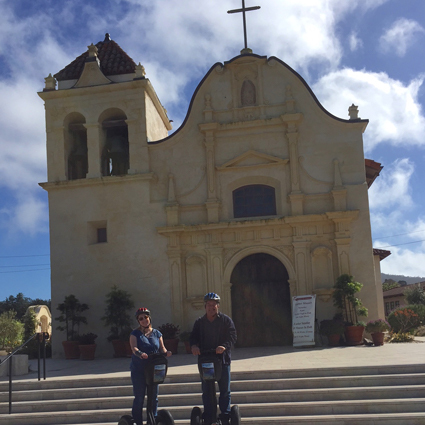 Ride your Segway north from Monterey on the path less-travelled. 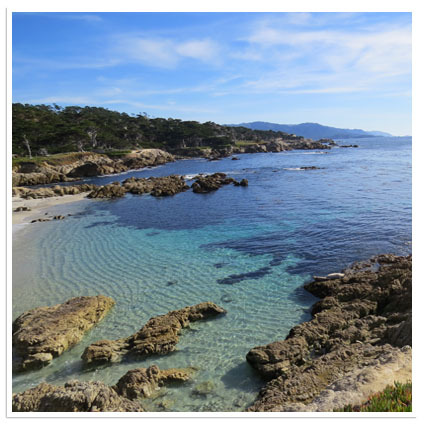 See beautiful views of Monterey Bay and, if you’re lucky, maybe some sea creatures. 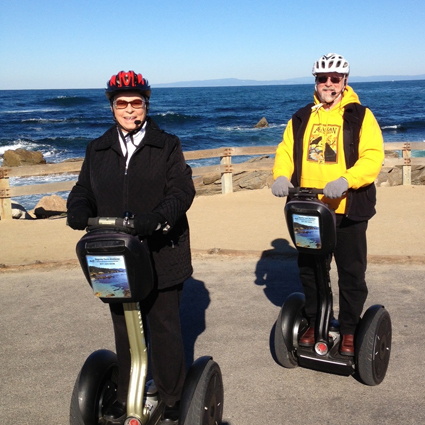 Take your Segway along part of Monterey’s famous 17-mile-drive. You will ride along the coastal trail past several famous landmarks. With one of our expert tour guides leading the way, you are sure to have a blast on your Segway tour. Your patient and supportive Segway tour guide will teach you to ride your Segway before the tour begins. With a little practice, the Segway feels like an extension of your body. It is easy to learn because it does the balancing for you. You do not need any special skills or even good balance. We offer several different tours from which to choose. Our most informative tour is the Historical Monterey Tour. This tour has you gliding along Cannery Row and then on a paved trail past Old Fisherman’s Wharf. We then wind through Monterey on the sidewalks, visiting some of the historical buildings along the way. You can also choose our Recreation Trail Tour. This is our most adventurous tour. If you just want to ride the Segway and are not interested in local history, this might be the tour for you. You will see some great scenery and enjoy the smooth ride on the Coastal paved trail. Our 17 Mile Drive Tour takes you along this famous path past some landmarks such as Pacific Grove, The Links at Spanish Bay, Point Joe, Seal Rock and others. This is our longest tour and the riding is easy as we roll along the road most often in a bike lane. You will enjoy gliding along the coast and taking in the ocean vistas. You can park for FREE at the Pacific Grove Tourist Infomation Center located at 100 Central Ave., Pacific Grove. If the center is open, stop inside to pick up a map showing you the short walk to 125 Ocean View Blvd. Pacific Grove, where our tours begin. The weather in Monterey is usually very nice but changeable. Bring a jacket or sweat shirt. Your Segway has a bag to hold items. The temperature is usually quite comfortable, ranging in the 60’s.